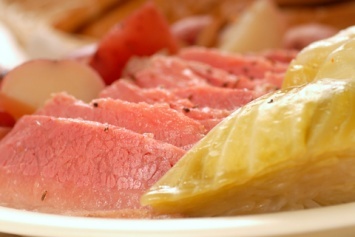 This is an old time authentic corned beef and cabbage recipe. It gives you directions for brining the meat from scratch, which takes several weeks. If you have the time, give it a try. The taste will amaze you! Combine the hot water, coarse salt sugar and whole spice. When the water has cooled, pour over the beef in a large enamelled pot or stone jar. Add the garlic. Weight the meat down to keep it submerged and cover the jar. Cure in the refrigerator for 3 weeks, turning the meat every 5 days. To cook, wash beef under running water to remove the surface brine. Cover with boiling water and simmer for 4 hours until a fork can penetrate to the center. 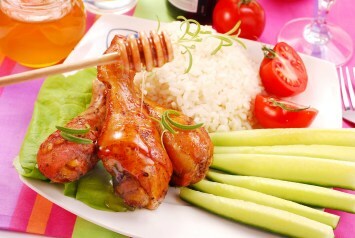 Remove the meat to a plate, but do not discard the boiling water. Use it to boil the vegetables. Peel and quarter the parsnips, carrots and turnips and simmer in the stock for 30 minutes. Skin and add the onions. Peel, quarter and simmer the potatoes in the stock for 15 minutes longer. Cut the cabbage into small wedges and simmer for 10 - 15 minutes. Reheat the meat in the stock. Serve the cut corned beef on a platter, surrounded by the vegetables. If you would prefer to use a prepared corned beef in brine, cook it according to package directions, then follow the directions here for the vegetables to go with it. Corned beef and cabbage is a traditional meal in several cultures, and is considered a must have by the Irish on St. Patrick’s Day. Whether it is St. Paddy’s day or any day, this traditional corned beef and cabbage recipe will warm your insides. And you just know with that leftover corned beef, the sandwiches the next day will be fabulous! Corned beef and cabbage is just one of our delicious beef recipes. Find them all here.